Harney charter school\’s board at a meeting in August 2018. The board ran the school until January, when it was taken over by the Orleans Parish school district. An audit of Edgar Harney elementary school’s former nonprofit operator, Spirit of Excellence Academy Inc., revealed more and continuing operational problems within the now defunct charter group. The report, a financial and compliance audit released Monday, flagged a problem with the school’s check disbursements and said its small finance department was a cause for concern. Both of those issues were flagged in last year’s audit, too. The 74-page document also noted the school’s failure to submit federal grant reimbursement requests on time, a lack of clear financial policies, failure to follow its own policies and poor record-keeping. The biggest takeaway from the audit, said Bradley Cryer, the Louisiana Legislative Auditor’s director of local government services, is that Spirit of Excellence, Inc. is unlikely to continue operating. “The biggest concern is they’ve lost their charter,” Cryer said. Practically speaking, however, that’s not really a concern. It’s the Orleans Parish school district’s plan. And it’s already been implemented. 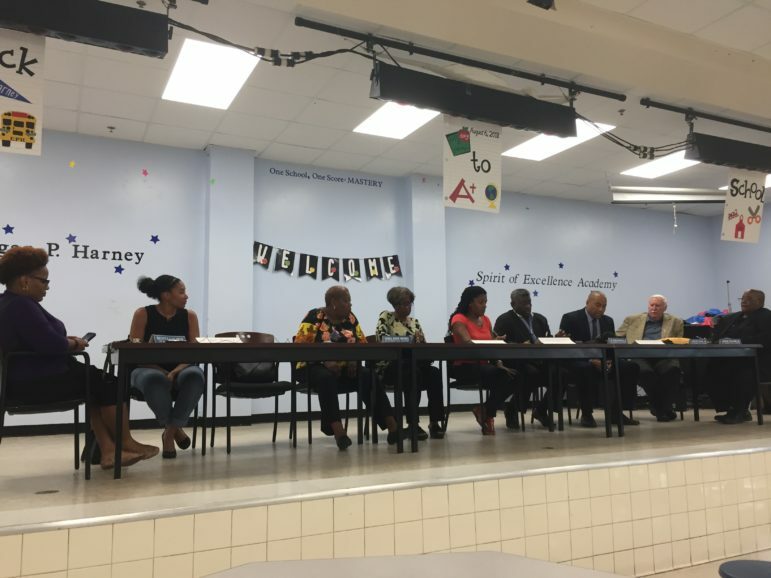 Last fall, shortly after announcing the school would close this summer due to repeated failures to comply with state laws and school board policies, Orleans Parish schools’ Superintendent Henderson Lewis Jr. asked the nonprofit’s board to step down and turn the school over to the district. The district forced Spirit of Excellence to surrender its charter for Harney mid-school year and took over day-to-day operations of the Central City school last month. The audit notes several financial and operational problems and some recurring issues. In the past, the organization failed to turn in financial reports to the state on time, improperly withheld tens of thousands of dollars in employees’ retirement contributions for weeks, sometimes months, and its small finance department caused concern. The auditors, as they did last year, found problems with check disbursements. Of 27 non-payroll related checks, seven cases had no approved check request justifying the amounts. Sarah Thorrick, a visiting assistant professor of accounting at Loyola University New Orleans, reviewed the report and said those check disbursement concerns translate to a “material weakness in internal control” over financial reporting. That means “that the process designed to prevent and detect errors and fraud in the accounting system was not functioning as intended,” she said. Auditors also had concerns about the school’s small finance department. A healthy finance department divides financial duties between multiple people, Thorrick said. “To help prevent fraud, we separate the following three duties: custody of assets, authorization of transactions and record keeping,” she said. That means at least three people should be handling those responsibilities. Harney had a two-person finance department. And those people were also in charge of other duties, like human resources. This is the second year in a row auditors have raised the issue. Cryer, the state employee, said it’s ideal to have three or four people reviewing finances at an organization. “What you want to have is more than one person involved in a process because anytime you have just one person doing anything, that person could cover up errors, make mistakes or cover up fraud,” he said. “By having two people that significantly reduces the risk of any kind of fraud or errors that are not detected,” he said. The Orleans Parish school district is running the Central City school now, but it faces a projected shortfall of about $430,000. Federal reimbursements earmarked for Harney this year would close most of that gap, but the school district is unable to access the money. That’s because Spirit of Excellence — like most other charter schools and charter networks in Louisiana — was legally its own school district, a state education official told The Lens. The state, which disburses the funds, is unable to transfer them from one district to another, the official said. Typically charter school management groups respond to each issue raised in an audit — by disagreeing with the findings, agreeing with auditors’ proposed solutions or saying that a solution has already been implemented. A spokeswoman for the Orleans Parish school district said the district had no comment on the audit.